Wilson Lourenco and co-workers have recently published an article describing two new species of Grosphus Simon, 1880 (Buthidae) from Madagascar. Grosphus simoni Lourenco, Goodman & Ramilijaona, 2004 is redescribed. The biogeography of the mentioned species is also discussed. A reanalysis of the type material of Grosphus simoni Lourenço, Goodman & Ramilijaona, 2004, associated with new material of this species from the northeast of Madagascar, has led to the conclusion that the male paratype of G. simoni belongs to a new, undescribed species. 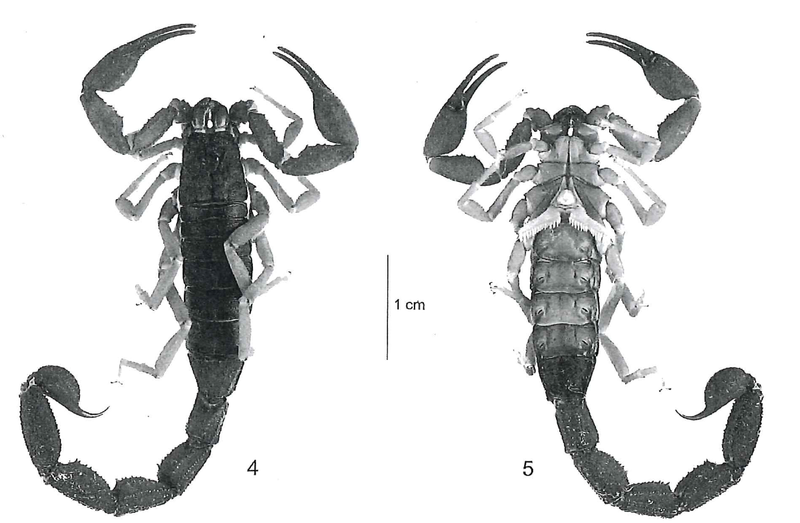 A large series of specimens collected in the Ambatovy-Analamay-Torotorofotsy humid forests, at around 1000 m, revealed the presence of another new species, also associated to G. simoni. Thanks to the supplementary material, with males and females, a new diagnosis is proposed for G. simoni and two new species are here described. Some general comments on the biogeography of the two new species and G. simoni are also provided. Lourenco WR, Wilme L, Soarimalala V, Waeber PO. Species of Grosphus Simon, 1880 associated to Grosphus simoni Lourenço, Goodman & Ramilijaona, 2004 with description of two new species (Scorpiones: Buthidae). Revista Iberica de Arachnologia. 2017(30):61-9.